We have two puppies available. Please see our "Puppies Available" Page for details. When I am wrong, he is delighted to forgive. When I am angry, he clowns to make me smile. When I am happy, he is joy unbounded. When I am a fool, he ignores it. When I succeed, he brags. Without him, I am only another man. With him, I am all-powerful. He is loyalty itself. He has taught me the meaning of devotion. With him, I know a secret comfort and a private peace. He has brought me understanding where before I was ignorant. His head on my knee can heal my human hurts. His presence by my side is protection against my fears of dark and unknown things. He has promised to wait for me... whenever... wherever -- in case I need him. And I expect I will -- as I always have. He is just my dog." 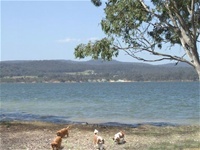 Home to our Kamawarie Cavaliers is an idyllic little spot beside one of the beautiful lakes in the green countryside of Gippsland Victoria. 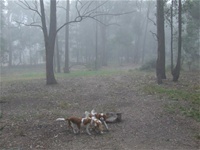 Here they run free over acres of securely fenced garden chasing birds, butterflies and each other. Our "kennel" is their "kennel'. They enjoy cool shady verandahs in summer and a chair by the fire in winter with always a spot on the bed at night. 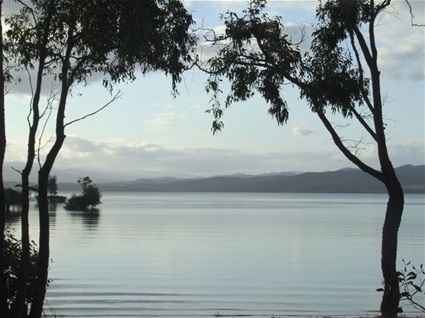 The lake is a special delight with exciting strolls around the shores and the joys of paddling in the shallows with flocks of ducks beating a hasty retreat adding to the excitement. Life is good at Kamawarie. "No one can fully understand the meaning of love unless he's owned a dog. A dog can show you more honest affection with a flick of his tail than a man can gather through a lifetime of handshakes"
Hi, Just wanting to know if you have any Ruby male pups available? I am just touching base about your two lovely girls and to let you know we are still interested in giving them a forever home. I am very interested in your two boys. only wanted a tricolour but am having difficulty finding an adult tricolour. I have just retired. Have found your request for a forever home to beautiful Molly. HI, just wondering if you have any dogs available for sale at the moment? I am looking for my 13 year old son who desperately wants a dog to love! 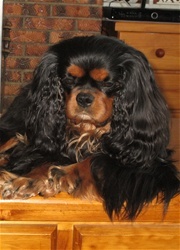 Hello, I am looking for a Cavalier King Charles spaniel as a companion for a 69 yr old lady. Would like to obtain a female up to 5 yrs old. Hello, just wondering when you have litters planned for this year please? I'm a mature lady, had 3 Cavvies over the years. Looking for a companion to shower with love and affection.